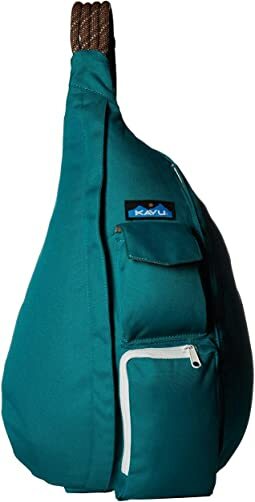 In 1993 KAVU, Klear Above Visibility Unlimited, was launched with a single product and a strong philosophy - live life to its fullest every day. An entrepreneurial spirit and this philosophy have provided direction for the company since its inception. 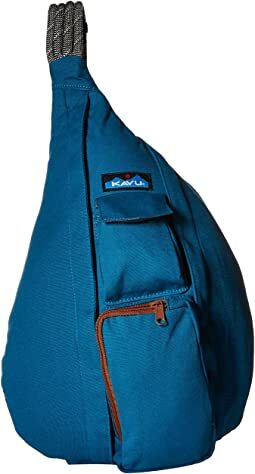 Out on the rough, windy waters of the Bering Sea over 13 years ago, KAVU´s Strap Cap was developed. It was a hat that would protect one´s head, keep the sun off the face, and stay on in the most powerful winds. The original Strap Cap is a canvas cap secured by a band of 5000 pound strength webbing allowing for on-head adjustment. 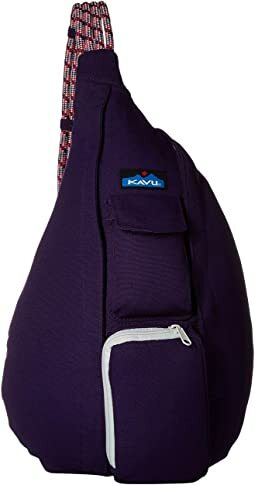 Now a signature KAVU piece, the Strap Cap stays on in almost any outdoor condition from Everest to the Zambezi river. 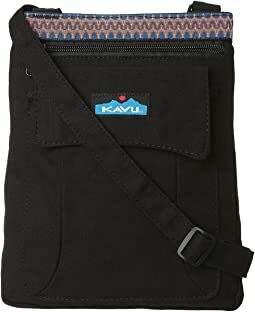 Today and everyday, KAVU creates men's and women's outdoor clothing using a variety of durable, rugged and comfortable fabrics in designs that take people through all the adventures of daily life. 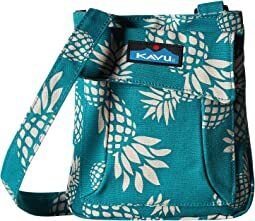 KAVU also has an extensive accessory line, including hats, bags, and sunglasses. The company staff and Team KAVU product testers enjoy the pursuit of the outdoors in their own backyard and around the world. 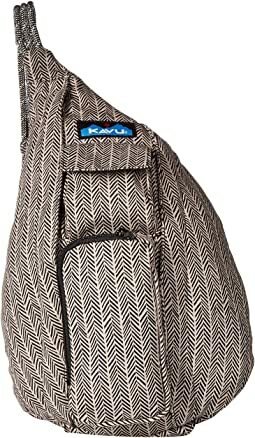 The enthusiasm in the quest for the perfect day still thrives at KAVU, or a KAVU day still drives the company to innovate and inspire outdoor fun through their line. 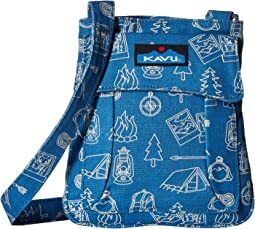 Really loving my new Kavu bag! I love the cross body style. It saves my shoulder and is easier to access than a backpack because you can just slide it around to the front. I love the front zip pocket for my phone, then there's another one on top perfect for keys or an energy bar. 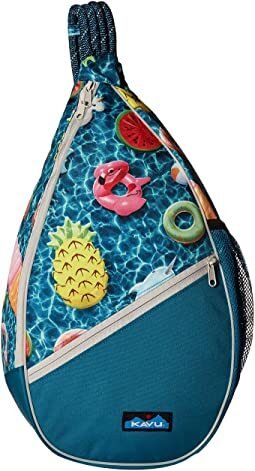 Then there's a side pocket I use for lipgloss, dental floss, and mom stuff like bandaids and wipes, and then the main pocket I use for my wallet, sunglasses case and notebook. I got a really punchy yellow color and I love it for spring/summer! It adds a fun splash! 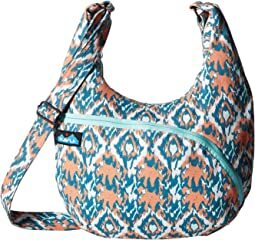 Wanted a "purse" that was hands free and not making me feel lopsided. 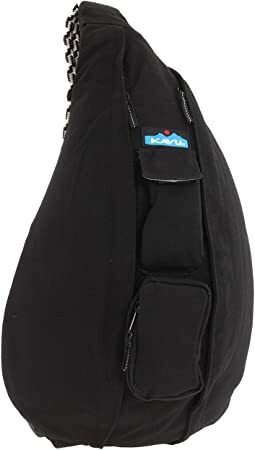 I get a lot of compliments on this bag and would recommend it to anyone. Love this wallet. I feel like I can stuff a bunch of stuff in there but it's never bulky. This purse is so soft and adorable! It's the perfect size for essentials. The inside material is a bit crinkly and cheap feeling, so I won't be over-filling it. The strap can be used as a crossbody, lays right at my waist above my hip (I'm 5'8). Overall, super happy with this purse and glad I purchased it! Great color! Love the Peony. 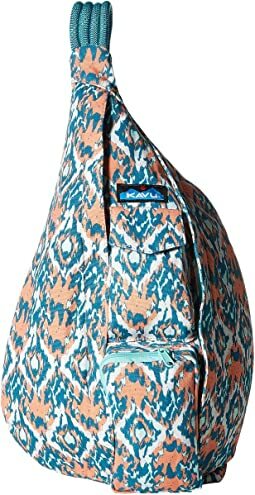 It goes well with the Luminous color Kavu Rope bag. Contrasting , yet complimentary colors. This light canvas type wallet is perfect with many compartments without being too big. A couple areas for bills, credit cards and change make it perfect. Love this wallet! 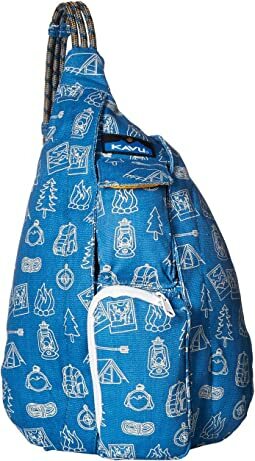 This Kavu Rope bag is awesome. Rad, hella stylish and rockin fun to use everyday for everything. I love this style sling backpack because it’s light, comfortable and has many compartments. After owning one, I now own 5 in different patterns and colors. The neon yellow green is so bright and goes with every color one wears. Instead of matching the walletI I bought from Kavu, I got a bright pink. The two colors make me smile. 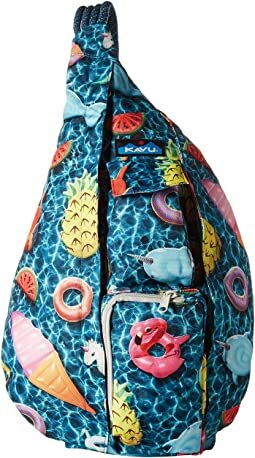 Go for this bag. 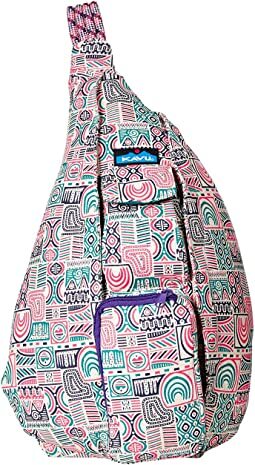 Compliments from strangers abound comes when wearing this Kavu Rope bag. 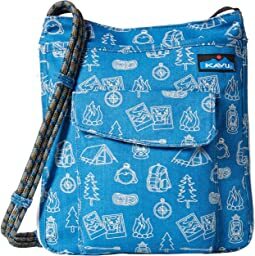 This bag is super cute, but I’ve had a few problems with it. First, I do wish it could be worn on either shoulder. I picked this bag up because I often had back pain from my purse. The bag didn’t seem to help the pain, but I feel like if I could switch shoulders throughout the day it would help. (Honestly though, I could probably carry less stuff!) The second issue I had is a rip where the zipper is sewn on to the small front pocket. The fabric pulled away from the zipper, though the pocket was not stuffed and it shouldn’t have happened so quickly. 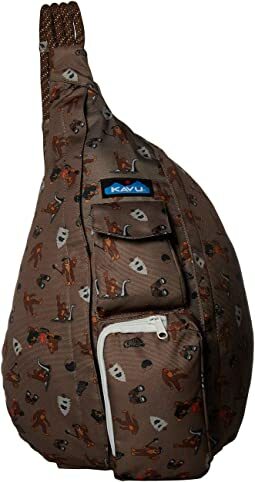 I reached out to Kavu and they replaced the bag, downside is they didn’t have the same pattern and I ended up with on that I just don’t like as much. It perfectly held my wallet, phone, a small notebook, and keys... but nothing else. :( There's not enough of a gusset to hold anything wider than about an inch, which is too bad because it's really cute and comfortable to wear. 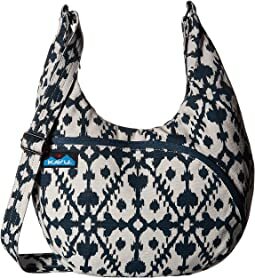 I'm not in the stage of life to be a purse-minimalist, so I went with the Kavu Sidney Satchel instead. 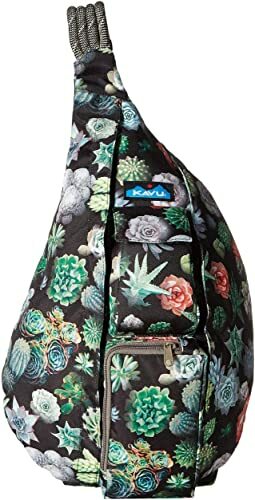 Just like my first Kavu bag that I purchased years ago, this one’s a “keeper”. (Couldn’t help myself) Such a fun pineapple print! It is a perfect size for crossbody use. I wore it to a ballgame and never felt the need to take it off. It holds plenty- iPhone, keys, cash, charge cards, lipgloss, Kleenex, Purell, chapstick, eyedrops and atomic fireballs. Buy this little purse..it will make your heart sing. I needed a bag that didn’t pull on my neck they way most purses do when you load them up, and this bag is perfect. They way it sits on my neck and shoulder makes it feel way lighter than my other purses, but it still holds all of my essential ???? This is nice! easy to flip around to access, so it seems more secure than maneuvering to dig through a regular purse. The small zipper pouch fits an iphone 8 plus, but barely. Zipping it fully closed resulted in the phone getting hot—no venting. 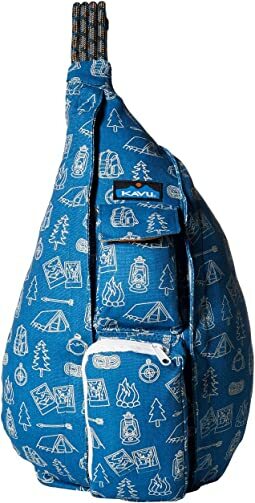 Kavu bag names are confusing, i had to flip through offerings way too much to figure out which bags were canvas versus polyester. Giving the bags a more intuitive name would help a lot—i almost gave up. Great bag lightweight but roomy!!! I loved everything about this cute crossbody bag EXCEPT the neutral color. I purchased the red rock loved the rich color but the neutral color which appeared more of a cream/beige on my computer turned out to be pinkish. I am not a “pink” person. I liked the easy return and the quick refund. I’m considering purchasing a different color. I'm not a "big" purse fan so this one is perfect. It has a great back pocket to hold a cell phone. The interior is large enough for a bigger wallet and some smaller things. Man, I did NOT like this bag. Not enough storage and hate it can only go over one shoulder (not ambidextrous). Love, Zappos! I like the print but the overall rating falls below 5 stars because of the hook and loop closure which makes it inconvenient and unsecured. Great weight when you’re out walking all day on an outing, instead of wearing larger Kavu, crossbody, or fanny pack. Just the right size for essentials because it starts out so light itself! Zip pouch inside great for credit card and license holders, and others accessories fit in well. Can be used crossbody by extending strap. I use my bigger Kavus all the time because they are so conveniently hands free...love that! I am so used to the pocket arrangement I have set up for myself, I think it would be too hard to use anything else now! 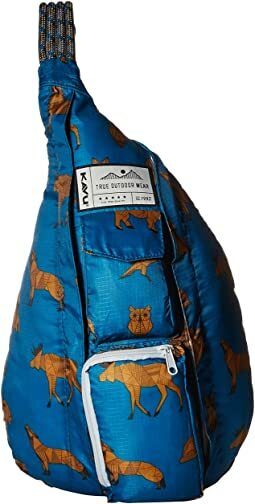 Perfect addition to my matching Kavu Rope Bag! I was in search of a wallet that would also carry my phone when needed. This perfect little wallet on a rope is exactly what I was looking for! 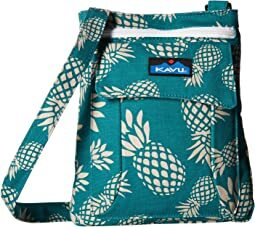 It fits nicely inside my larger Kavu Bag, yet when I want to carry light on a walk or such or simply run into a store I will grab this, sling it across my chest or hand carry it and off I go! My iPhone fits perfectly inside the inner pocket and all is zipped us nicely. I'm able to carry my iPhone, my cash, my credit cards, and a few bandaids. Highly recommend it! Bought for a Disney trip. Very small. Returning for the larger size. This bag is a wonderful size and had great pocket configuration. I cannot speak to the fit and comfort of this bag because it's a gift. The color I chose is definitely more vibrant in person and the fabric seems to be a durable quality material. I would definitely recommend. I really like this hat and was viewing it for a while. This hat is not a perfect circle base but I think it’s better like that in terms of functionality. Great hat overall. Was not impressed. Very stiff material and zipper not easy to use for as much as I would need as an every day purse. Gave it to my 7 year old daughter for a travel tote. Would not recommend for an every day purse.